Download "Issue Current Law House Bill Senate Bill Mandatory"
2 DUI courts RCW Counties have authority to operate DUI courts Authorizes municipalities to either "independently" operate DUI courts or enter into cooperative agreements with Deferred sentences SRA Sentencing Reform Act Generally deferred sentences are not available for any DUI offense however, in a few cases, courts have been sentencing offenders charged with a gross misdemeanor DUI offense to a deferred sentence. 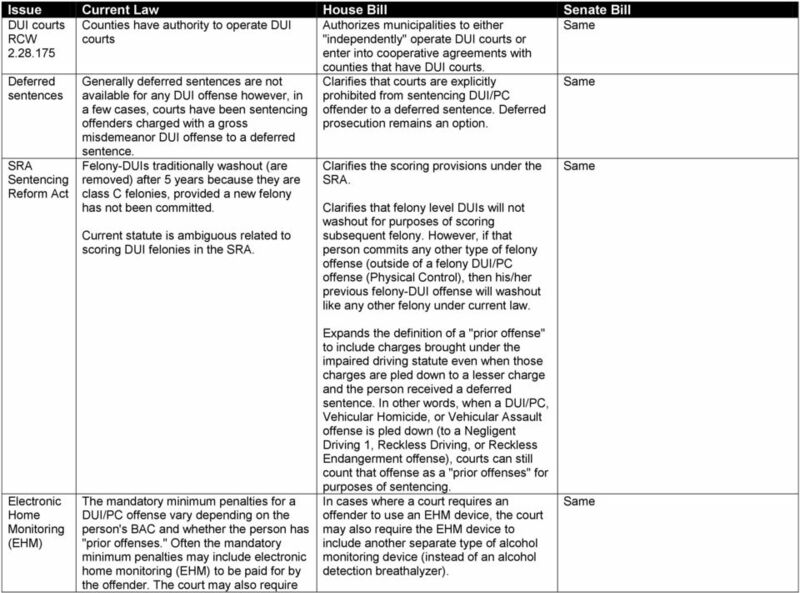 Felony-DUIs traditionally washout (are removed) after 5 years because they are class C felonies, provided a new felony has not been committed. Current statute is ambiguous related to scoring DUI felonies in the SRA. counties that have DUI courts. Clarifies that courts are explicitly prohibited from sentencing DUI/PC offender to a deferred sentence. Deferred prosecution remains an option. Clarifies the scoring provisions under the SRA. 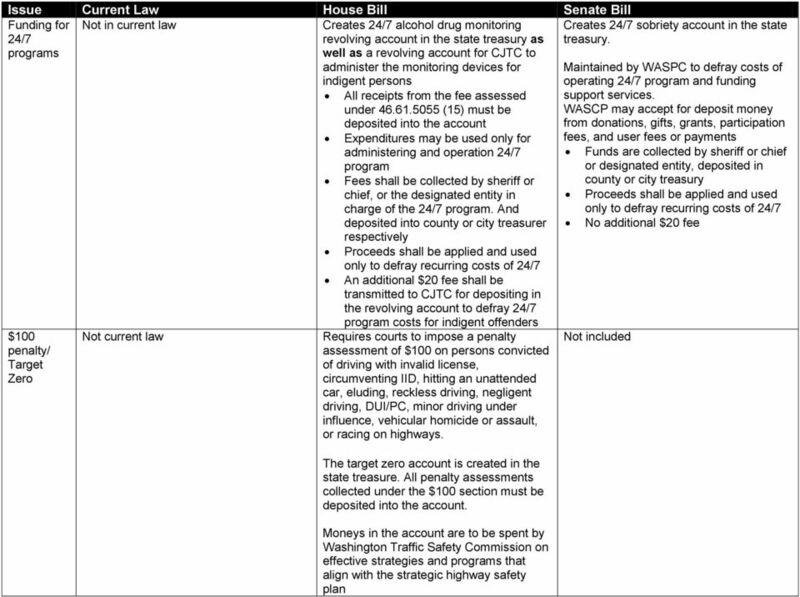 Clarifies that felony level DUIs will not washout for purposes of scoring subsequent felony. However, if that person commits any other type of felony offense (outside of a felony DUI/PC offense (Physical Control), then his/her previous felony-dui offense will washout like any other felony under current law. 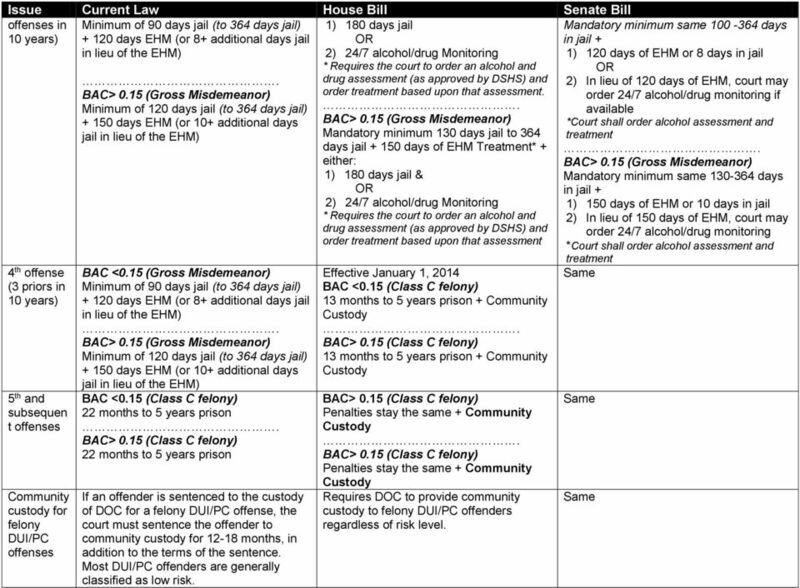 Electronic Home Monitoring (EHM) The mandatory minimum penalties for a DUI/PC offense vary depending on the person's BAC and whether the person has "prior offenses." Often the mandatory minimum penalties may include electronic home monitoring (EHM) to be paid for by the offender. The court may also require Expands the definition of a "prior offense" to include charges brought under the impaired driving statute even when those charges are pled down to a lesser charge and the person received a deferred sentence. In other words, when a DUI/PC, Vehicular Homicide, or Vehicular Assault offense is pled down (to a Negligent Driving 1, Reckless Driving, or Reckless Endangerment offense), courts can still count that offense as a "prior offenses" for purposes of sentencing. 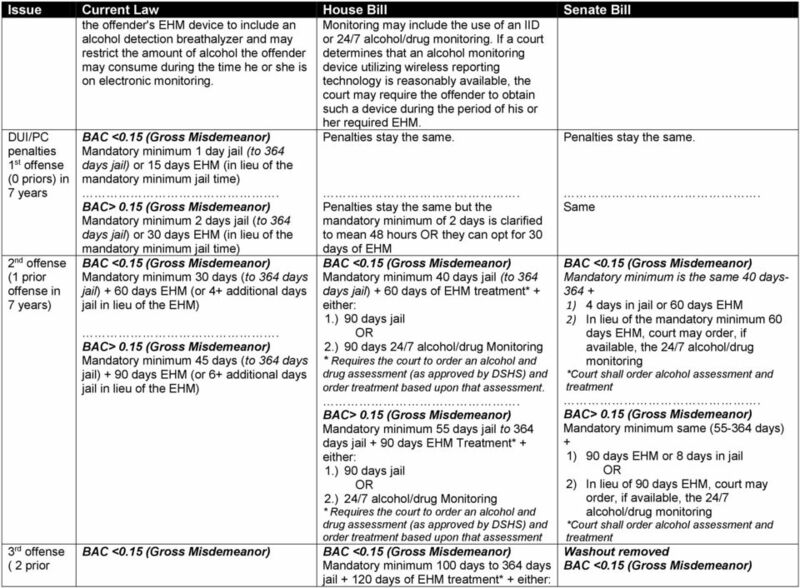 In cases where a court requires an offender to use an EHM device, the court may also require the EHM device to include another separate type of alcohol monitoring device (instead of an alcohol detection breathalyzer). 5 Conditions of probation Does not add both to the language Regulation of IIDs Whenever a court sentences a person for a gross misdemeanor DUI/PC offense, the court must also impose probation with conditions that include: (1) Not driving without a valid license and insurance; (2) Not driving while having an alcohol concentration of 0.08 or more within two hours after driving; and (3) Not refusing to submit to a breath or blood test when a law enforcement officer believes the person was driving or was in physical control of a motor vehicle while under the influence of alcohol. 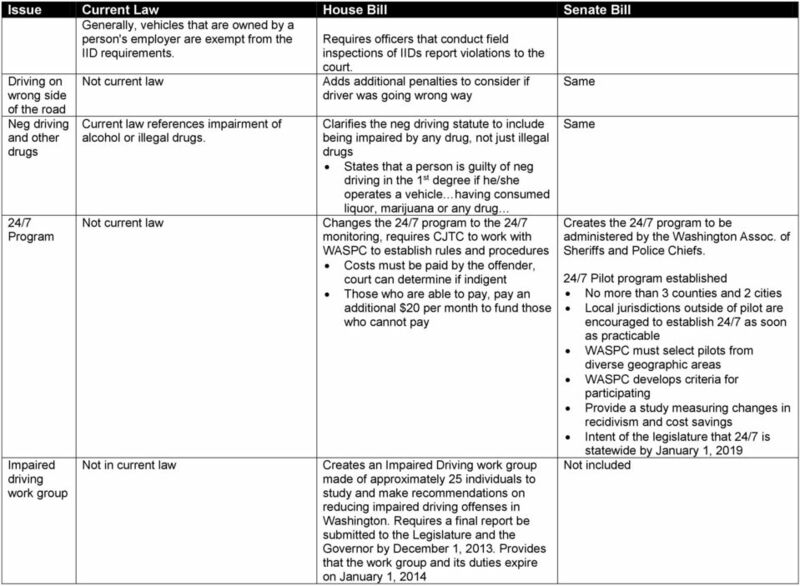 The Washington State Patrol (WSP) provides standards for the certification, installation, repair, and removal of ignition interlock devices. 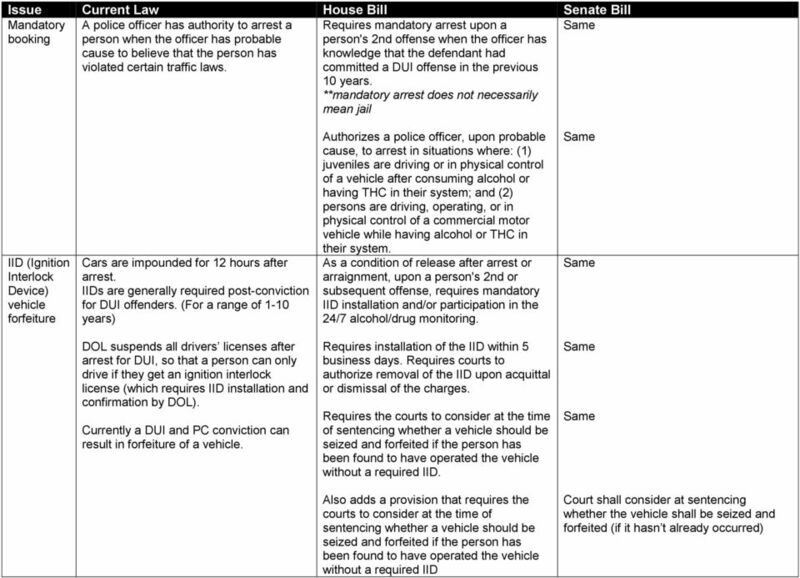 Clarifies that conditions of probation that are imposed must prohibit an offender from: (1) driving without "both" a valid license and liability insurance; and (2) driving or being in physical control of a vehicle while having THC in his or her system. Has a provision for mandatory 3 to 6 months participation in the 24/7 program as a condition of probation. 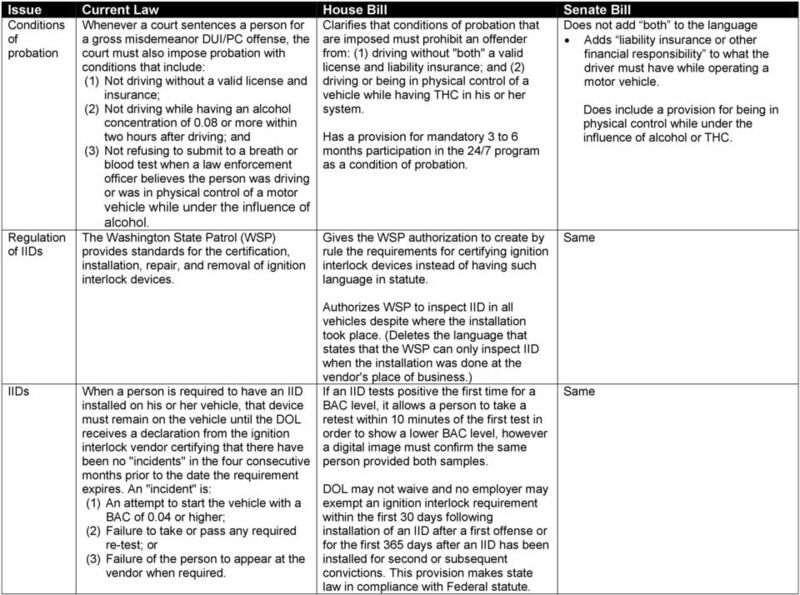 Gives the WSP authorization to create by rule the requirements for certifying ignition interlock devices instead of having such language in statute. Adds liability insurance or other financial responsibility to what the driver must have while operating a motor vehicle. Does include a provision for being in physical control while under the influence of alcohol or THC. IIDs When a person is required to have an IID installed on his or her vehicle, that device must remain on the vehicle until the DOL receives a declaration from the ignition interlock vendor certifying that there have been no "incidents" in the four consecutive months prior to the date the requirement expires. An "incident" is: (1) An attempt to start the vehicle with a BAC of 0.04 or higher; (2) Failure to take or pass any required re-test; or (3) Failure of the person to appear at the vendor when required. Authorizes WSP to inspect IID in all vehicles despite where the installation took place. (Deletes the language that states that the WSP can only inspect IID when the installation was done at the vendor's place of business.) If an IID tests positive the first time for a BAC level, it allows a person to take a retest within 10 minutes of the first test in order to show a lower BAC level, however a digital image must confirm the same person provided both samples. DOL may not waive and no employer may exempt an ignition interlock requirement within the first 30 days following installation of an IID after a first offense or for the first 365 days after an IID has been installed for second or subsequent convictions. This provision makes state law in compliance with Federal statute. Outskirts Press and the OP logo are trademarks belonging to Outskirts Press, Inc.
POST Action: Officer was found to be "uncertifiable" and permanently barred form serving in this capacity.